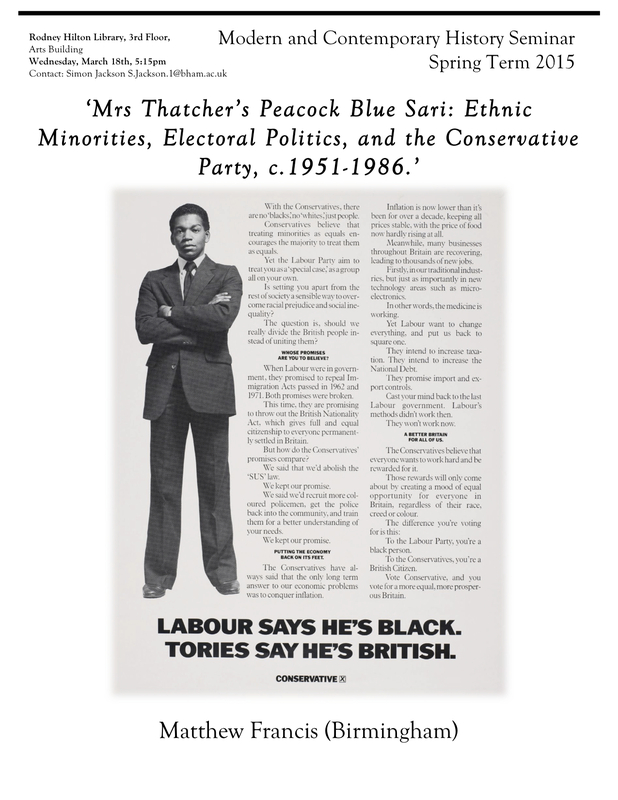 Spring 2015 Week 10 Seminar: Matthew Francis: Mrs Thatcher’s Peacock Blue Sari: Ethnic Minorities, Electoral Politics, and the Conservative Party, c.1951-1986. Abstract: Frontiers, ‘ungoverned spaces’, and ‘failed states’ continue to exert a powerful grip on the imagination of states and their agencies, as recent events in Iraq and Syria have demonstrated. Throughout the nineteenth century, the British colonial state in India viewed its northwest ‘frontier’ with Afghanistan in similar terms – as a violent geography, an ‘uncivilised’ ‘outlaw state’, ineffectively governed, prone to perpetual bouts of conflict, and as the originator of violent resistance groups and regional conspiracies. 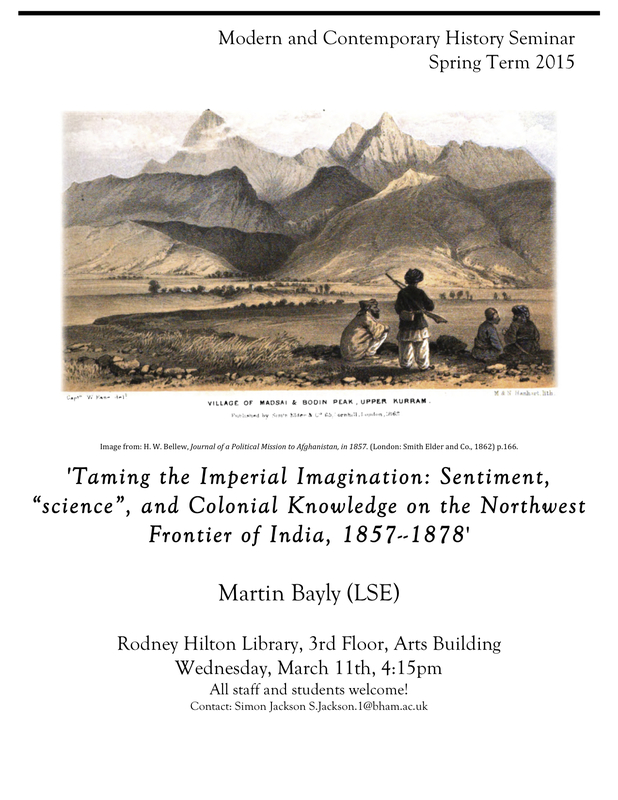 This early draft paper, which draws upon a chapter from a forthcoming book, considers how colonial officials constructed imperial space on India’s northwest territories in the mid-nineteenth century (modern day Pakistan). 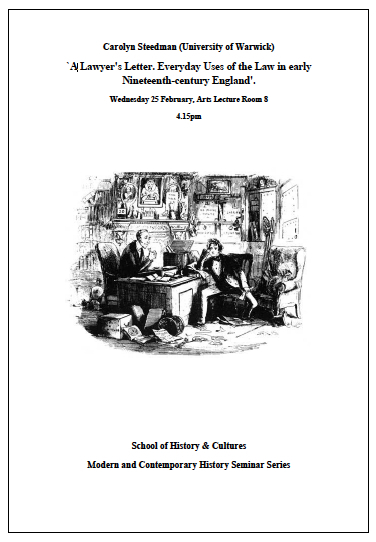 The paper explores how this spatial regime – an amalgam of colonial knowledge, new ‘scientific’ modes of governmentality, and wider imperial visions of global order – evolved and shaped British relations with Afghanistan during this period, eventually leading to war in 1878. In particular, the paper shows how a new and vocal military ‘epistemic community’ was able to capture policy discussions which became couched in terms that prioritised imperial defence, signalling a shift away from earlier forms of ‘embodied’ colonial knowledge, towards a more generic, ‘disembodied’, and utilitarian style of policy advice. This rationalization of geopolitical space, and the policy advice it spurned, put further distance between the myth and reality of colonial authority, particularly on the fringes of empire. The paper, although largely empirical in nature, offers new avenues of exploration for those interested in the construction of political space by powerful actors, and for those interested in imperialism and International Relations more broadly. It also offers an historical perspective on the enduring urge to rationalise contemporary imaginative geographies of disorder and violence. 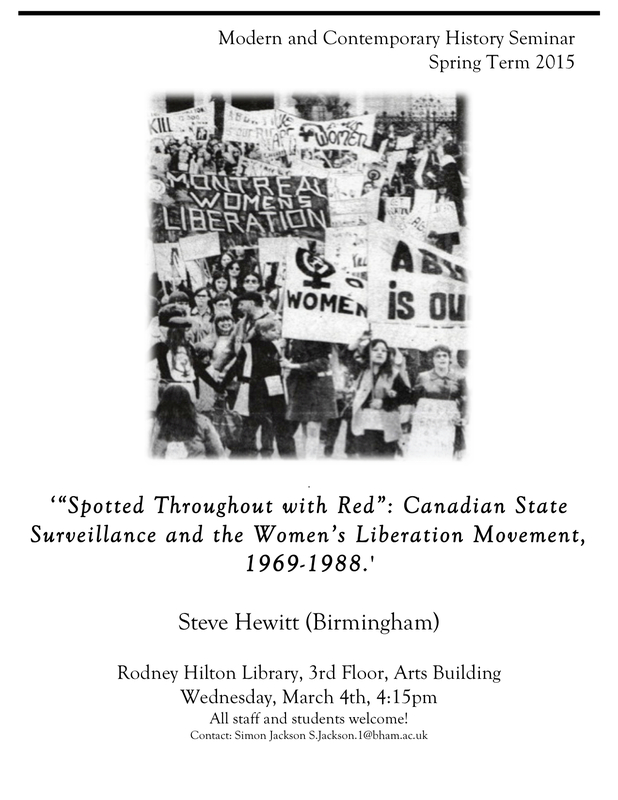 Abstract: Drawing on Canadian state security records, the problematic nature of which will be discussed, this paper examines the tactics and strategy used by the largely all-male police against the Women’s Liberation Movement between 1969 and 1988. It argues that ultimately the police’s own lack of clarity about what it was pursuing in terms of subversion combined with external factors, including the nature of the movement it spied upon, not just weakened its surveillance campaign but ultimately helped undermine counter-subversion as a dominant characteristic of the Canadian security state. Finally, the paper will argue that in an era of WikiLeaks and the revelations of Edward Snowden, it is crucial to recognize that certain groups and individuals disproportionately experience surveillance, both in the past and in the present.